Did you know that e.l.f. Cosmetics has mineral makeup out? 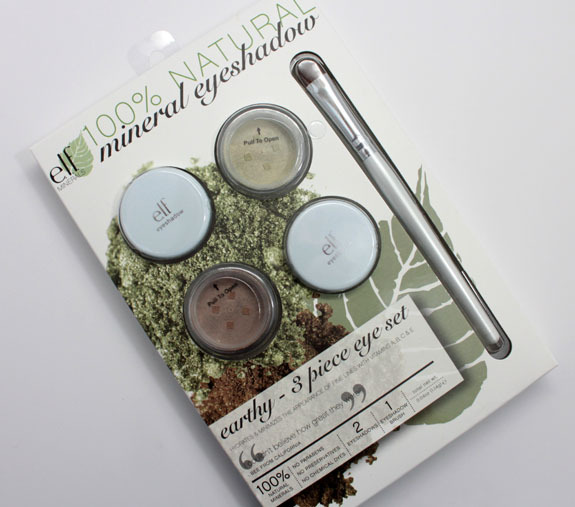 I had no idea until I saw the new limited edition 100% Natural Mineral Eyeshadow sets at Target recently. These sets each come with two mineral eyeshadow pots and a brush. There are three sets Earthy (include Earthy & Caffeinated), Nudes (includes Elegant & Celebrity), Romantics (includes Sweet & Sassy). They contain vitamins A, B, C & E which help hydrate and minimize the appearance of fine lines. They are 100% mineral based with no parabens, no preservatives and no chemical dyes. 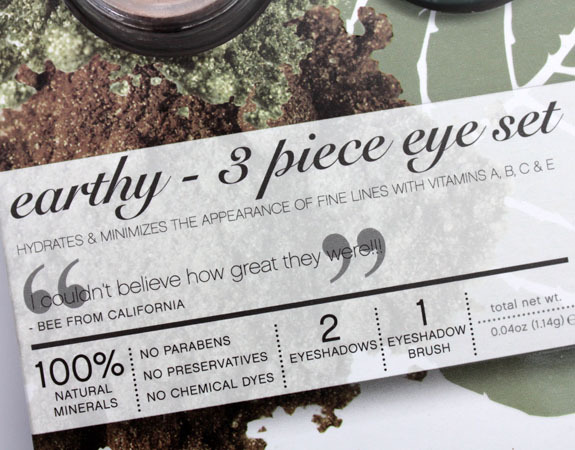 Earthy is the one that stood out to me because it contained a gorgeous looking green and coppery brown shade. The pots come in a shaker style. Nice large holes so it’s easy to get the product out, but doesn’t give you TOO much. Caffeinated is a deep copper brown shimmer. Truly the kind of shade I gravitate towards now in eyeshadows. Great pigmentation, easy to blend. Earthy is a medium shimmery celadon green. This has a little yellow shimmer in it. Pigmented but not as deep and luxurious as Caffeinated is. Considering these are just $5.00 for the set, I think they are a really good buy. Loved both shades and textures, and really loved the price! The size for each pot is 0.02 oz. Have you tried these yet? 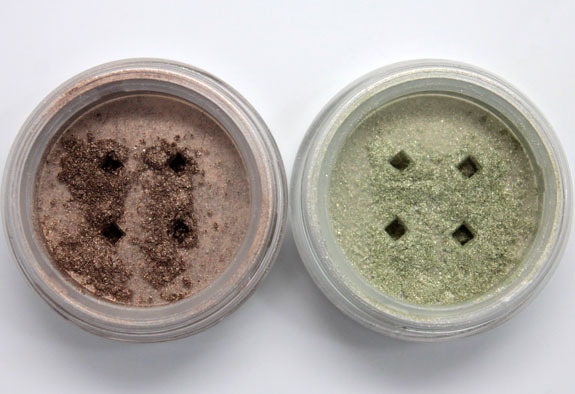 Do you like/dislike/are indifferent to mineral eyeshadows? 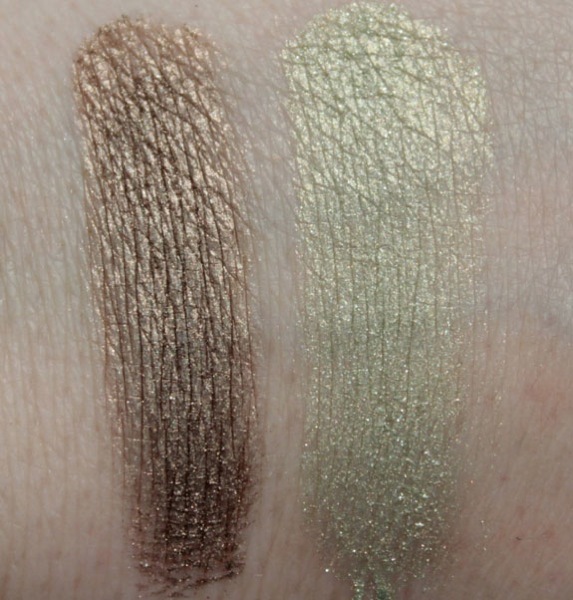 Misa Hot Summer for Summer 2012 Swatches, Review and…GIVEAWAY! They look pretty – what a bargain! I love mineral eye shadows! I love to use them wet for a more bold look and dry for everyday wear. Can’t wait to try these! And I’m loving the price. I really like hem! I don’t know why e.l.f isn’t more available in stores here. A lot of the times, websites don’t ship here so I have to go through third parties and it’s mighty annoying. These mineral shadows are really great. I have all of the shimmer ones that ELF makes, plus a couple of the matte shadows. 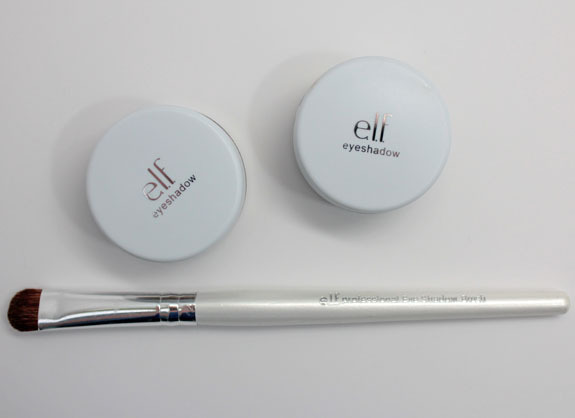 I order a lot of ELF cosmetics online because they are always having great sales. Definitely check out more of these if you can Kelly. The mineral lip glosses are great too (extra small doefoot applicator is my only complaint). Great stuff from ELF! WOW! Must try these out soon :D! I like mineral eyeshadows, will have to look for these. Great price! These are really pretty colours! I’m a fan of mineral eye shadows, as long as they don’t contain bismuth oxychloride. The price is right. I LOVE mineral makeup! Can’t see a reason why I shouldn’t try these out. Oo Earthy is pretty, would like to try it over my Sin PP. I did not know ELF had minerals! This is an incredible buy, love both colors. I never realized they made this. I haven’t been using pigments much but this set could change my mind. I hope I can find it easily. I really like Caffeinated- it looks pretty rich and pigmented. For the price it’s hard to go wrong! The Lacquer Tracker´s last post…Lynnderella Connect the Dots Giveaway! Wow! These look pretty! I saw this set at Target on Sunday, but I didn’t think much of it. The Target closest to where I live carries _very few_ E.L.F. products so I didn’t even bother to check these. I didn’t know they were cruelty free! Another bonus. Thanks for the post!